The free-to-see biennial art spectacular will soon shutter for another two years. 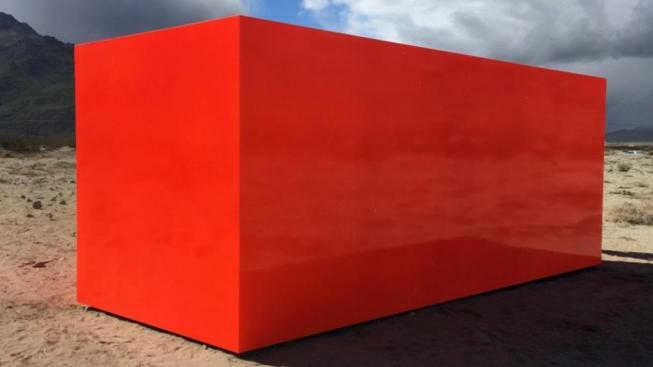 The 2019 run for "Desert X" is in its final push, so see "SPECTER" by Sterling Ruby, and several other monumental works by acclaimed artists, for free, in and around Palm Springs through April 21. Desert X: For sure, headlines are being made in the desert at the Coachella Valley Music and Arts Festival these days, but something else spectacular, and surreal, is afoot. It's this free-to-see art biennial, the one with the mega and mysterious installations, and it is about to close on Sunday, April 21, following a 10-week run. That means you still have time to behold "SPECTER" by Sterling Ruby, Kathleen Ryan's ethereal "Ghost Palm," and several other spread-out, idea-big works. Getting the app is a grand idea, but you can find a physical Desert X hub around the desert resort cities, too. "Artists for the Hammer Museum": Major auctions make major news, but the Sotheby's auction headed for New York in May boasts some noteworthy Southern California connections. Several "celebrated artists with strong ties to the Hammer Museum" have donated some 40 works, all to help "the creation of a New Artist Fund." Are you a fan of Judy Chicago, Barbara Kruger, Catherine Opie? Make time to call upon the UTA Artist Space between April 17 and 20 to see these pieces, which not only deliver big on the ideas/images front, but will support future artists to come. Easter Extravaganza: The Easter Bunny is super-duper busy these days, which means that finding him for a photo might mean you'll need to look on the weekend. But at Irvine Park Railroad in Orange? He's visiting on weekdays, too, which means your little ones can have a sweet spring snapshot. There are several cute activities happening at the attraction, including those famous train rides, and Easter egg hunts, too. Parking costs, entry is free, and activity tickets are six bucks each (and some activities require more than one ticket). More? Hoppity-hop over here. Free Tuesday: Descanso Gardens is still blooming, and word from a few days back is that the La Cañada Flintridge destination's Japanese Garden is still looking like a painting, thanks to oodles of blossoms bursting up in the fruit trees. How to savor all of this, for free? And on the day after April 15, too, when many people are looking for some post-tax decompression? By visiting the gardens on its monthly free day. That's the third Tuesday of each month, which, in April 2019, is April 16. Breathe, think, walk, enjoy. Griffith Observatory: The cosmos aren't closing, nor are the planets packing it in, and the stars above? Not dimming. But one of the main conduits to cosmic wonder will be locking up, for just over two weeks, beginning on April 22. For sure, the historic Griffith Park landmark will reopen on May 6, after some needed work is completed, but if you're hoping to soak in some exhibits, displays, and astronomical knowledge soon, best get up the hill before the 22nd. And, as always? Griffith Observatory is free.